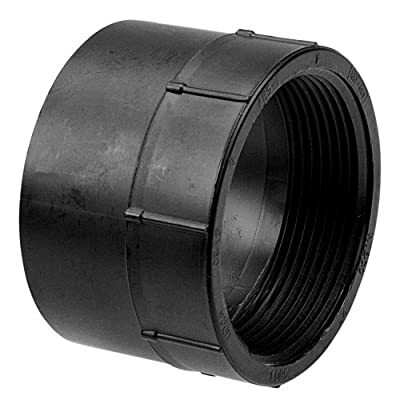 Size: -- Choose Size -- 1-1/2" 2" 3"
The NIBCO 5803 schedule 40 adapter pipe fitting is made of acrylonitrile butadiene styrene (ABS) for use in drain, waste, and vent systems (DWV) and has a hub connection and a female National Pipe Taper (NPT) threaded connection. This adapter fitting connects pipes or fittings with different end types, diameters, or materials. It has a female hub opening on one end for connecting to a male unthreaded pipe and female NPT threads on the other for connecting to a male threaded pipe. The NPT threads create a tighter seal than straight threads, and the hub end connects to pipes with a smooth bore for enhanced flow. This schedule 40 (standard wall) fitting is made of acrylonitrile butadiene styrene (ABS) for use in non-pressure residential and commercial drain, waste, and vent (DWV) sanitary systems. ABS resists most household chemicals and many corrosive and abrasive industrial liquids, performs under a wide temperature range, has high impact resistance, and is lighter in weight than metal for simple installation above or below ground. This fitting is compatible with schedule 40 ABS-DWV and can be connected to other materials such as steel, copper, or cast iron using transition fittings. This fitting provides superior flow to metal because of its smooth interior finish, which reduces friction and inhibits buildup of materials. This fitting meets American Society for Testing and Materials (ASTM) D2661 and D3311 specifications for quality assurance. Pipe fittings are components used for connecting, terminating, controlling flow, and changing the direction of piping in many different industries. When purchasing pipe fittings, consider the application, as this will affect material type, shape, size, and required durability. Fittings are available threaded or unthreaded, in many shapes, styles, sizes, and schedules (pipe wall thickness). NIBCO manufactures flow-control products for construction, industrial, fire protection, and irrigation applications. The company, founded in 1904, is headquartered in Elkhart, IN, and meets International Organization for Standardization (ISO) 9001 standards for quality assurance.